Sorry to burst your end-of-summer bubble, but Christmas is coming up fast. I’m anxious for fall because I love this time of year. While I like the holiday season, sometimes Christmas gives me anxiety because it can easily burn a hole in my wallet. The average American spends $1,000 on Christmas each year. It can be very stressful if you don’t have that money because when you don’t prepare your budget and save in advance, you’re likely to take out some debt. This means the cost of Christmas rises as you have to spend the new year paying that debt off and making interest payments. That certainly doesn’t sound like the most wonderful time of the year. The best thing you can do to prepare your finances for the holiday is to start saving and rounding up cash now. 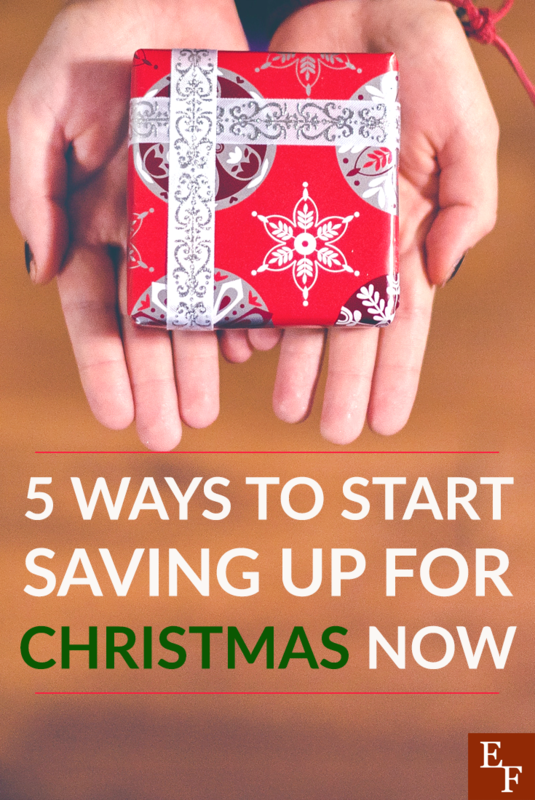 Here are 5 of the best ways to start saving up for Christmas. Figure out how much you want to spend on Christmas this year by listing out all your projected expenses. Once you have your total, divide it up by how many savings transfers you wish to make before you start spending money on the holidays. Maybe you want to set money aside each week or each month. You can set up automatic transfers from your checking account to your savings account. This ways you can easily save up the money you need over time. I like setting up recurring automatic transfers because it takes a lot of thought out of the entire savings process. I also like to build a savings ladder for the holidays. So, I’ll start by saving $50 per month toward the end of the summer. Then, I’ll save $100 per month in the fall, and increase my contributions to $200 per month in November and December. Another easy way to start saving up for Christmas is to earn cash back through credit cards and other loyalty rewards programs. Try using both Ebates and Swagbucks when shopping online to earn cash back. Swagbucks will also allow you to earn points by doing other things like taking surveys, watching videos, searching online, and playing games. About 2,500 Swagbucks can be redeemed for a $25 gift card or $25 in cash via PayPal. I’m sure if you get started right now, you can earn $25 each from both Swagbucks and Ebates and put that money toward your holiday fund. Another way to earn cash back is by using cash back credit cards. I’m currently using a cash back card that pays me 1% cash back on all purchases (no limits) and 1% cash back after I pay off my purchases. I love how card users are encouraged to pay their bills on time with this option. I use the card for groceries, gas, and other expenses that I can pay off immediately. As always, if you’re going to use a credit card for rewards, you should do so wisely. Only spend what you know you can afford to pay back in full each month. Fall is the perfect time to become more frugal in preparation for the expensive holiday season. Go through your budget and see if there are any expenses you could cut or reduce in order to free up more money for holiday savings. Remember, the changes you make only have to be temporary. As an example, you can consider cutting out expenses like a gym membership, cable tv, dining out, or even lowering your grocery bill and phone bill and raising your insurance deductible. Personally, if I wanted to free up $100/month that I could start saving for Christmas, I would cut my gym membership to save $36/month and commit to doing some at-home or outdoor workouts. I would consider getting rid of Netflix which would save me $10/month. We haven’t had cable for years, but we also have Hulu, so we could just rely on that for television or even rent movies and shows from the library for a few weeks. I would also try to cut $30/month off my regular dining out budget, and try to cut my grocery bill by $20/month. To do this, I would stick to my budget, take advantage of sales, and cook affordable meals in batches to cut down on the cost per portion. I could also commit to walking or riding my bike to nearby places for 1 days a week to lower my fuel spending by $10/month. Finally, I would look into temporarily raising my auto insurance deductible to lower my monthly premium. But, if you’re doing the math, you’ll see that I’ve already rounded up $100+ in savings just by making a few small lifestyle changes. Did you know that you can earn a cash bonus by simply opening a new bank account? It’s one of the easy ways to make money just in time for the holidays and an even better bonus if you’re not too pleased with your current bank to begin with. Tons of legitimate banks are willing to offer you hundreds of dollars just for opening your account with them. In order to receive the bonus, you’ll need to meet a few requirements like setting up direct deposit and some banks even want you to have 2-3 deposits go through first before you receive the money so be sure to give yourself enough time to earn the full bonus amount. Yet and still, there’s plenty of time to jump on any current offers and earn your cash bonus right before you start shopping for the holidays. Earning extra money is one of the most effective ways to start saving up for Christmas. See if you can do any extra tasks like landscaping, babysitting, or pet sitting to make some extra money. You could also consider getting a seasonal side job. Most retailers are hiring for seasonal work around this time. If you’re looking for something more flexible, consider driving with Uber or Lyft. Both companies pay weekly and could offer a generous sign-on bonus to new drivers. Plus, you can set your own hours and drive whenever it’s convenient for you. Have you started saving up for Christmas yet? What tactics are you using?